@Sageheart: Unfortunately, I can't take credit for the sculpting of those. @Lennysmash: Thanks for your comment. 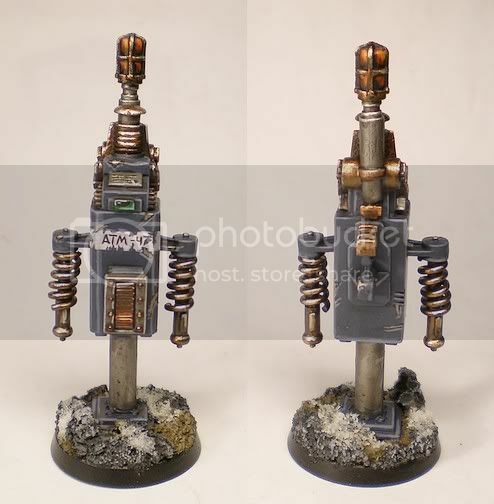 I just painted the main torso of the objective marker in a grey-ish blue (will add some markings and such to make him look more pleasing) and not green as you suggest, but your idea finally got me thinking and put me on the right track i think. I don't really mind the changes in Paintpots because since the screw-top ones they introduced in the late 90s (which were pretty much horrible), all changes were for the better so far. And as I said, I also like the new ones (apart from the fact that they look way smaller than the 2003 paintpots. All they need to do is add that tiny little lid and I'm happy. I also use Vallejo paints (VMC and VMA) but mostly to fill gaps in the Citadel palette and for basecoating (which VMC are great for). Never really got the fuzz about dropped bottles. They're nice for Model Air colours but on VMC, I really don't need them and would prefer regular pots. But to each their own I guess. Price is a good argument though. At first I wasn't too sure on how to tackle that guy but I'm starting to like him. 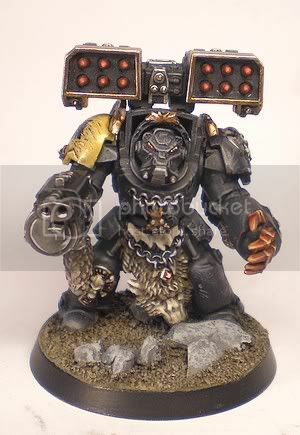 He reminds me a lot of the time I painted the Warboss for my Space Orks army (bottom of the page). Anyway, I'm proceeding pretty well and it's fun to paint him. My cold is getting better as well and I'll do a little trip to GW on Monday to get a replacement for the miscast Sicarius I recently got. 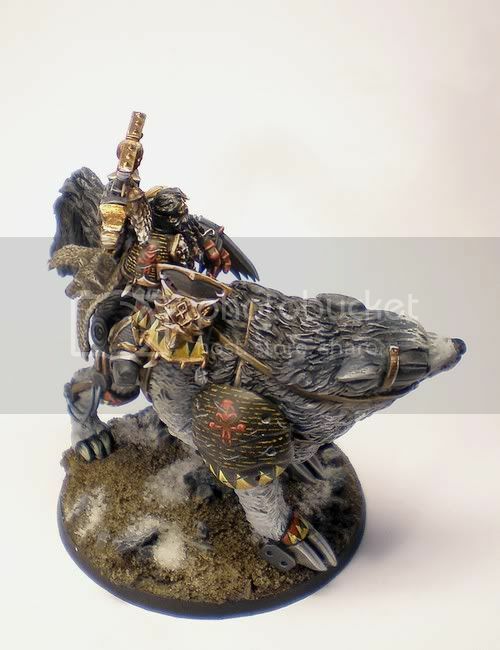 Absolutely loving the wolf lord.... is the wolf sculpted or purchased, and if so where?? @dantay_xv: I get this question a lot. They're bought. Just google for "wargamma.com". 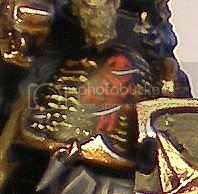 So basically the heraldry of the lord is continued on the Wolf as well, effectively making him a "battle brother" by giving him a left shoulderpad with the gread company badge on it. 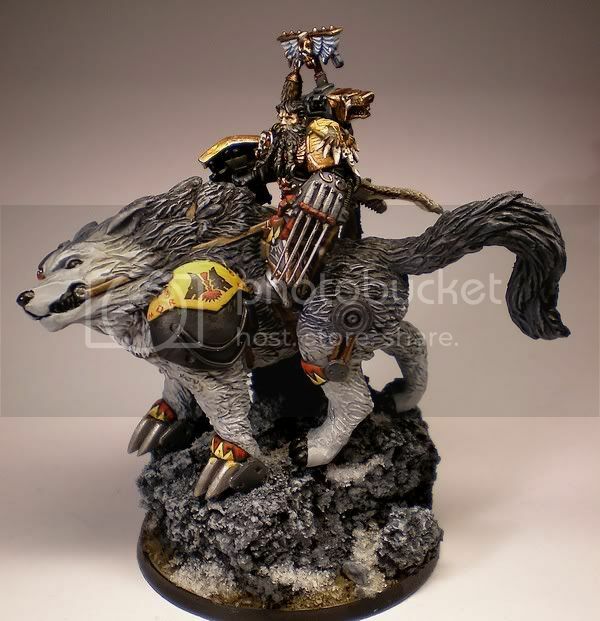 Yep I do, so is this Erik Morkai, the Wolf Lord himself? The painting is great and I'm assuming you'll weather the metals a little too. I had a good old laugh though because an ATM here is a cash point. 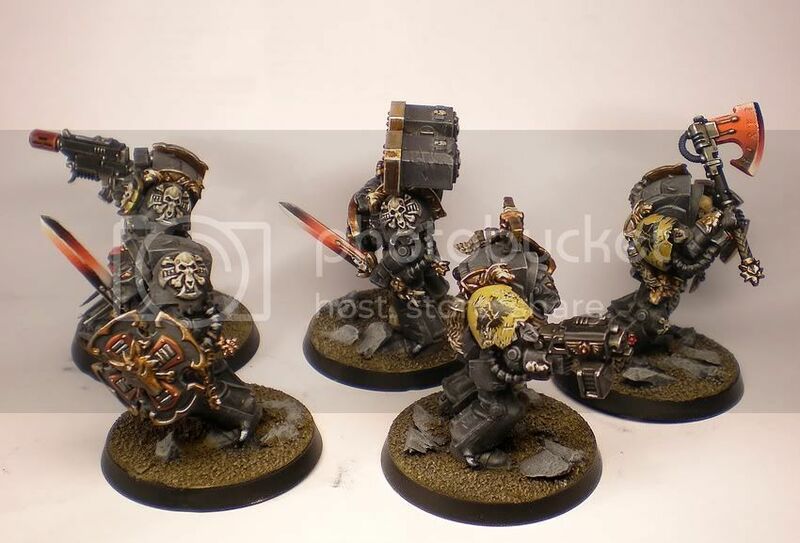 I just have an image of a line of Space Wolves and Orks all lined up waiting to take out cash. Where did you get the wolves from? Inspiring stuff, and great to see some love for Rackham paints! @Lennysmash: Thanks for the comment. The ATM thing is deliberate. I figured I had to do something "funny" with this one because it's such an inexplicable, techy wotsit of which nobody really knows what it does so I thought it may be just as well an ATM. @inmygravenimage: Cheers. I don't particularly love them but I got them at a sale, I think the pots are okay enough and they're alright to work with if watered down a lot (otherwise, they get a little "rubbery"). Small update - marker's done! Cute thing that. He really looks like some kind of 1950s TV series robot. the thunder wolf that has its mouth open you can see the gap... Cool paint job btw. @Sageheart: Glad you like it. @Miss Dee: Thanks for the heads up. Yeah, I'll have to fix that. A new chooser of the slain marker or just a regular casuality. Is that a pun on the scene in Dog Soldiers? Hand him some super glue. "Oh, Jesus....my guts are out, Coop!" -SGT Wells, with his abdomen torn open, in great pain. "Then we'll just put them back in again!" -Cooper, trying to push the Sarge's intestines back in and stick it with super glue. 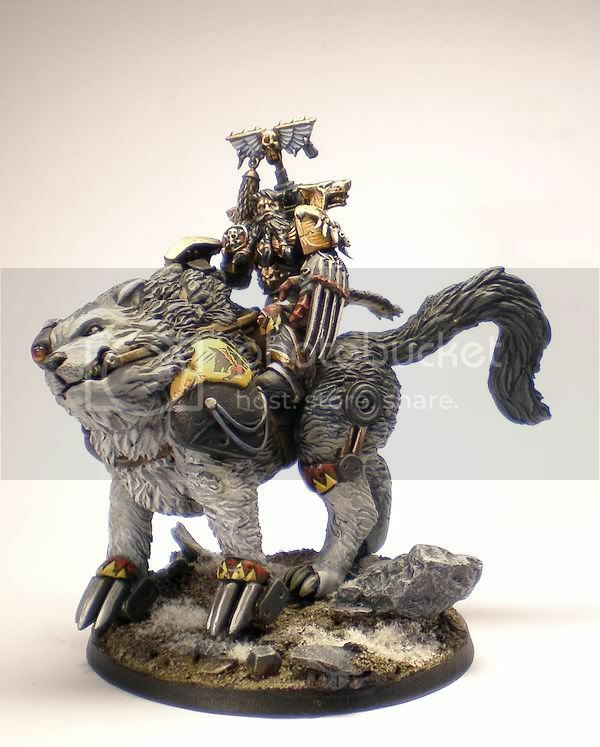 I really like the dying marine, and more so that is how I always pictured a fenrisian wolf. @manoknok: Not seen the movie, but your quote is getting me intrigued. 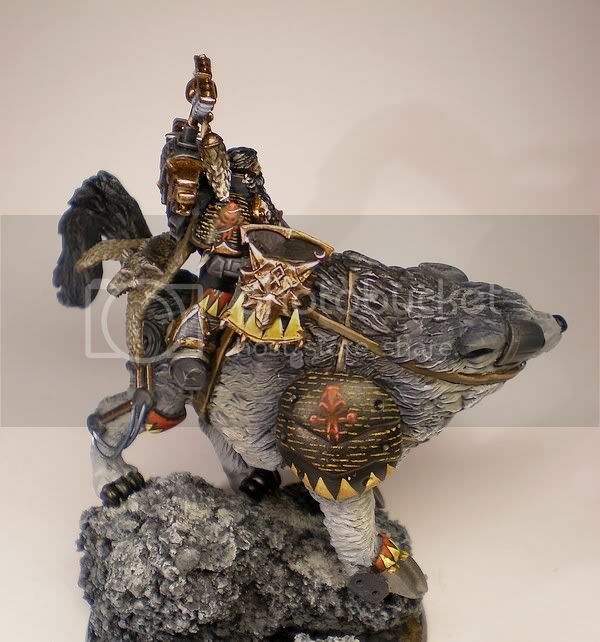 @wolfshadow: About the painting - sure, about the modelling - hardly possible, I didn't sculpt them. 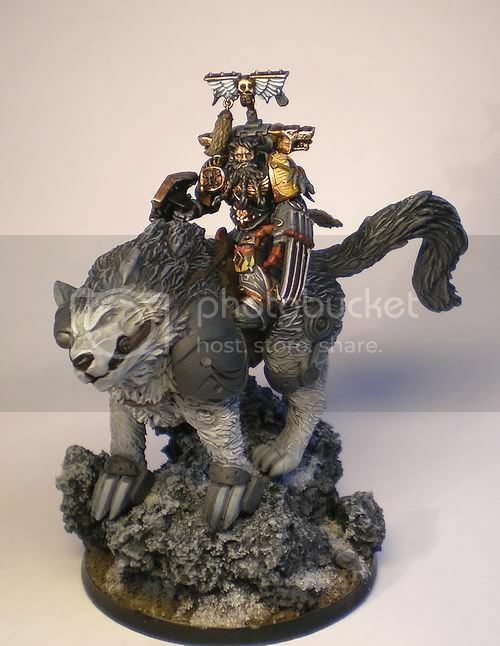 My client preferred to have his own personal sculptor do the wolves. ...aaaaand here's what I'm doing now: Bloodbowl! I probably should have been doing something else today (like finishing one of the bazillion other project on my table) but these minis were very tempting. 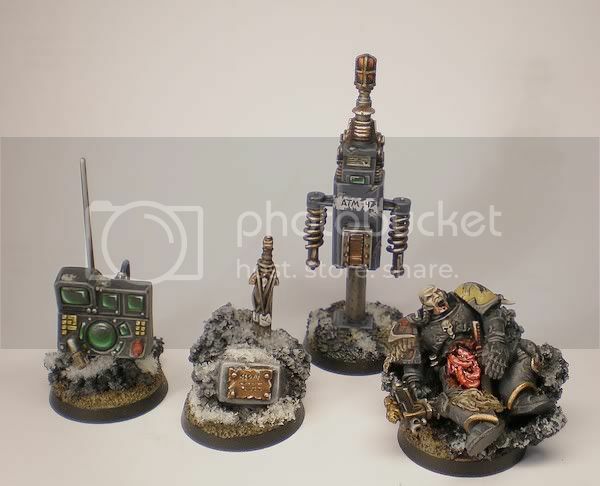 These, like the Bloodbowl Frogmen I did a few months ago, are by Gaspez Arts and now I'm fully convinced that they know their stuff. The Frogmen were cute as a novelty theme but these sculptors also do very, very good classic humanoid chaos marauders. Excellent. 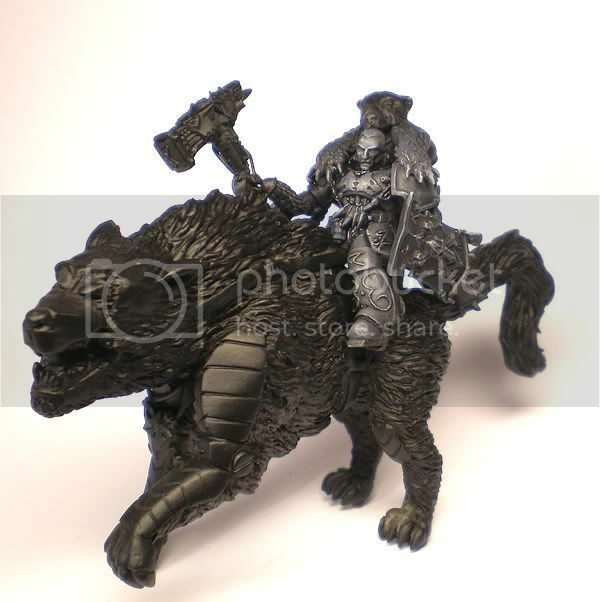 The miniatures are very big, definately more like 30 to 32mm scale than 28mm, but they're neat and fun to paint. That's why I'm also going a bit over the agreed painting level on this job. Anyhow, let me apologize for the rather bad pictures; they look neater in real life. 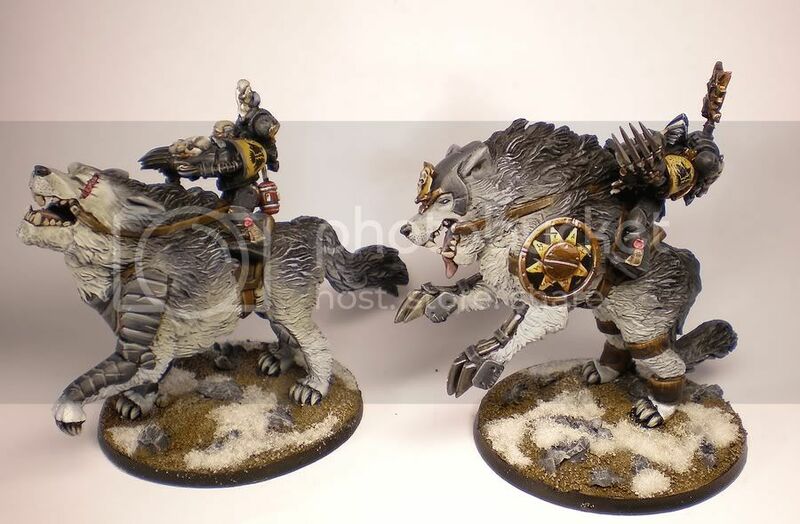 Hope to finish these guys tomorrow so I can return to Space Wolfy stuff, Chaos Space Marines and whatnot. Seeya then! 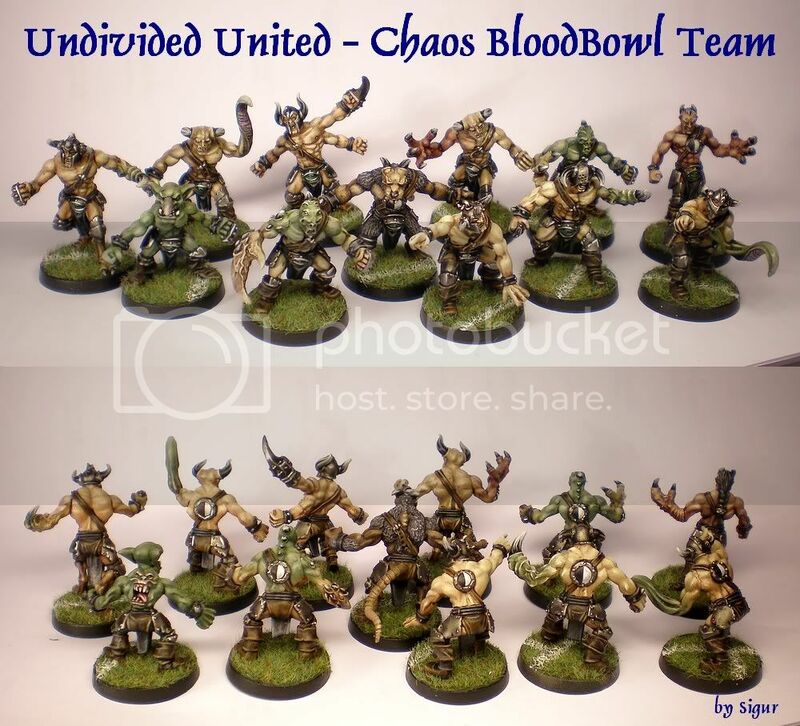 Nice looking blood bowl team. 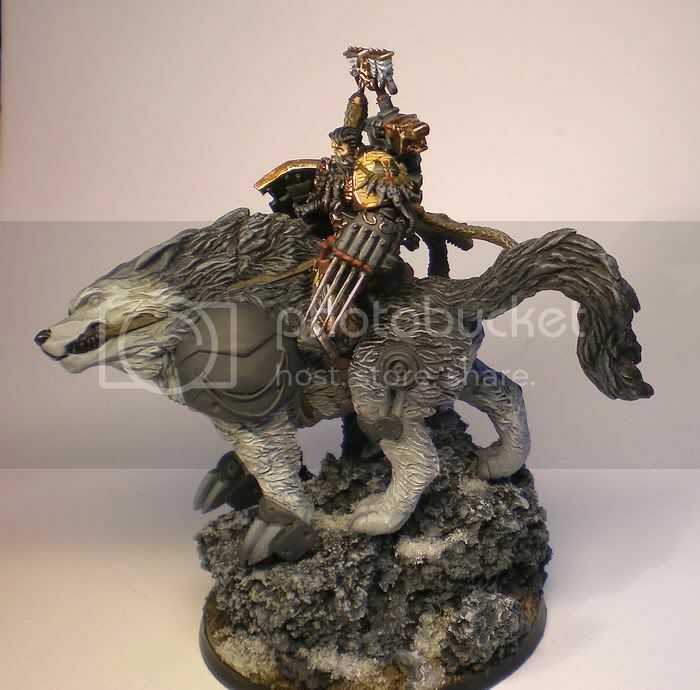 Thats a shame you didnt sculpt the wolves. 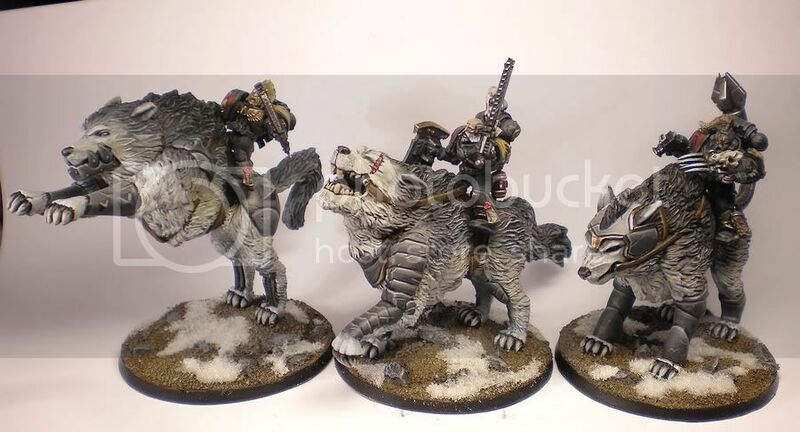 qwolfshadow: Yeah, I'd love to take credit for having modelled these wolves though. I really kind of went over the necessary level but these were fun to paint. Seeing as how they have loads of mutations, I tried to make them colourful and diverse whilst sticking to a certain number of base colours. They really represent Chaos Undivided and look like true inhabitants of the deep chaos wastes. Out of the three BB teams I painted so far, these have to be my favorite. Each miniature is a whole character. 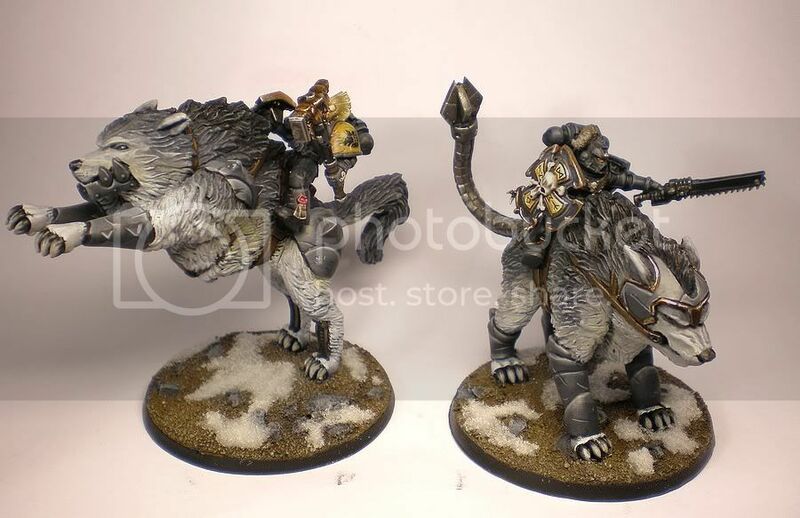 If you ever plan to get a Chaos team for BB - get these miniatures. 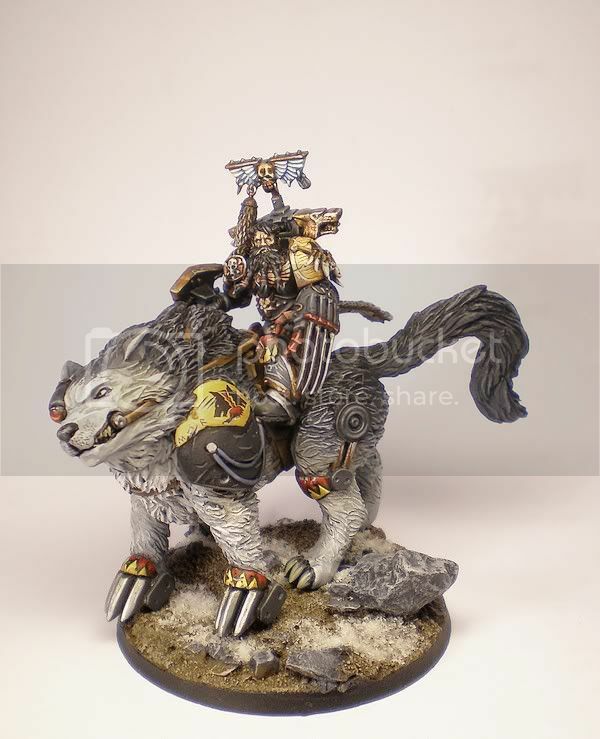 And here's a Space Wolves update as well! Well, not that much of an update really...but I got new pictures at least! Apart from that, I have to apologize to the cheap-o Revell airbrush gun. A few weeks ago, I more or less called it a useless piece of junk that doesn't work. I have to retract the "useless" part. It's really useful for varnishing a lot of miniatures at once. Tears through your paints but gets the job done quickly. Speaking of airbrush matters, my new moisture trap/pressure regulator arrived. Works fine now and the whole thing is almost airtight now. Woohoo! Anyway, thanks for looking. C&C welcome as well! A wee bit monotonous to paint. Planning to have them finished by mid-next week at the latest. Whats the best way to you get motavated to do other peep's minis? Good question. I think that many people burn out pretty quickly after starting serious commission work and I'm a bit surprised I haven't (yet ) completely burnt out. 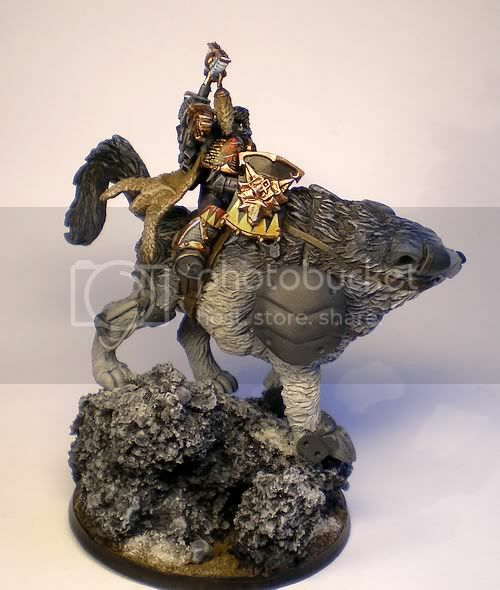 Had a pretty big low in fall 2009 though and this weekend, I was just not able to touch any fantasy minis. But in general, I guess I'm pretty resistant to monotony or boredom. Apart from that (and I know how corny that sounds), I really love painting those little buggers and I'm so darned happy that I have the opportunity to do this for a job now and at times I'm panicking that I might fail and am not able to do this any more or that I get some physical condition and can't paint minis any more. So depending on how you look it, it's either love for the subject or block-headed, cold-blooded panic of the future. As for suggestions to others - I guess it's important to find a balance between keeping work diverse and getting stuff done. So it's a good thing to work on different subjects at once but keeping in mind that they should get finished fast. 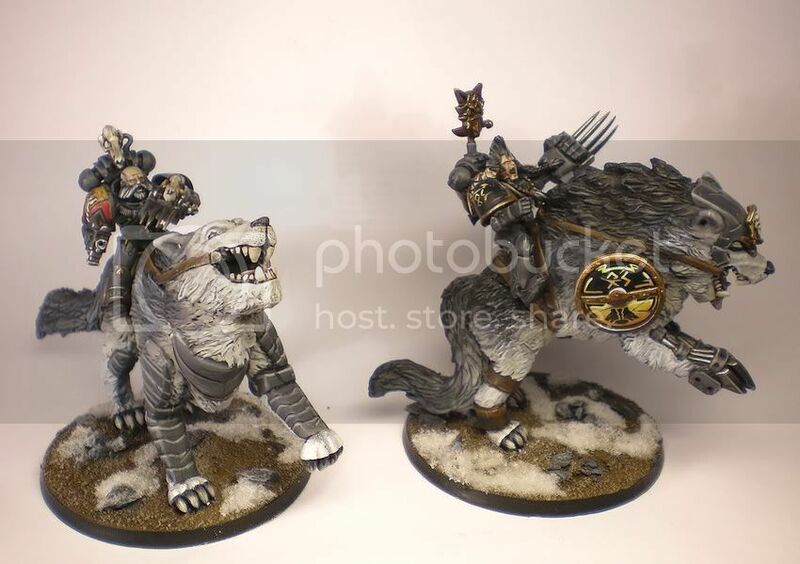 He wants standard space wolves minis but the blasted sw grey dont go well over shadow grey so i have to put a light grey over that ... I now know what im gonna do and thats miss out the shadow grey. 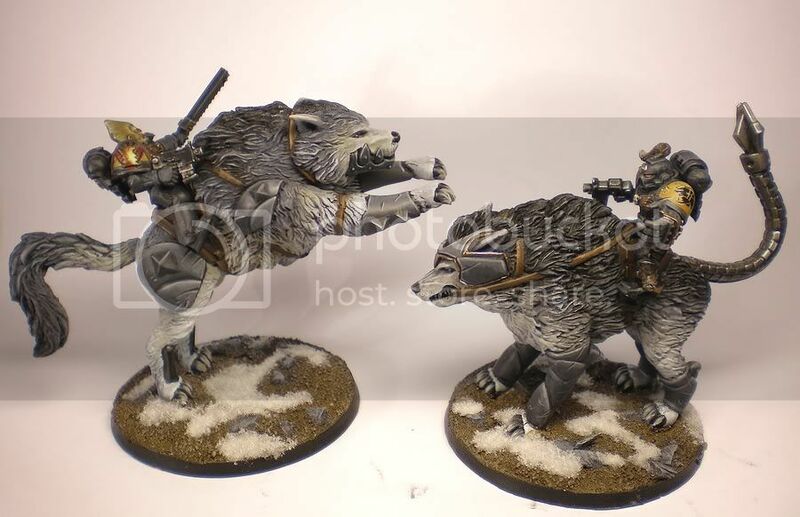 So I was able to overcome my utter inability to even look at grey Space Wolves and got a bit done. 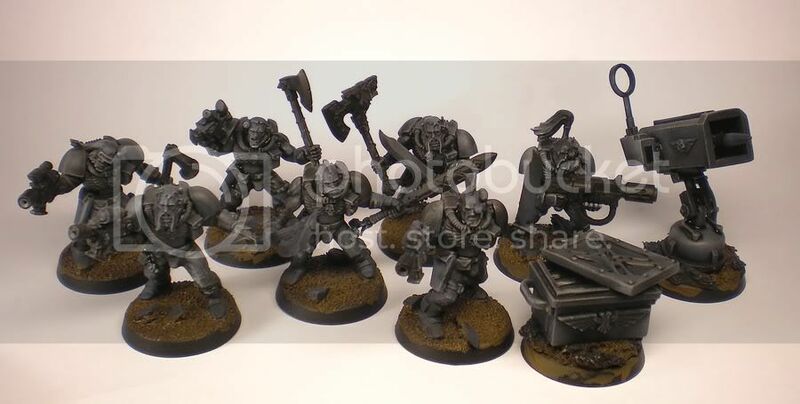 The guys in the front (axe and prominent sword) have power weapons, the guy with the bare arm to the left of the poweraxe guy is getting mark of the Wulfen. Armless guy will get a Melter. 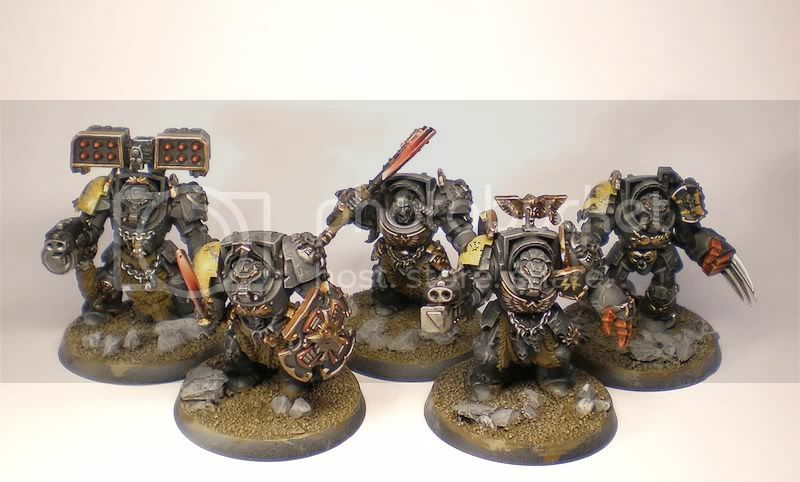 I guess I shouldn't write that down because it doesn't sound motivated but I figured that whining will make me seem so much more authentic, so here we go: painting grey power armour is no fun. Battle Damage is completely annoying. Two days ago I got some work done on the Khorne Berzerkers as well. They're about 70 to 80% finished now. Lovely stuff here Sigur, looks absolutely great. Okay, I know there hasn't been an update in quite a while. So let's see what's new...I've mainly been working on some Khorne Chaos Space Marines but they're still not finished (sorry). I only had two days or so to think of something to do, build and paint everything so it's not perfectly executed but it was fun putting the thing together. 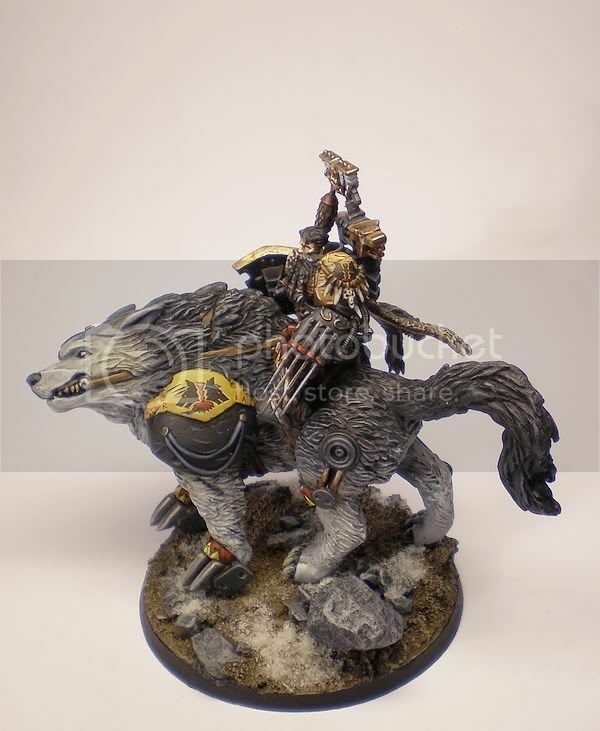 Apart from that, the Thunderwolf Cavalry and a Wolfguard Hero will be finished within the next few days. 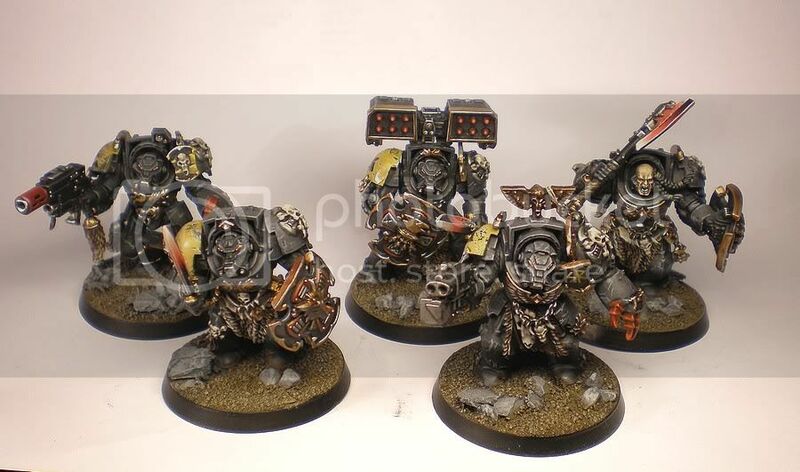 The first five Terminators are about 70% finished. Not sure, maybe I need to redo the power weapons completely which would be very annoying but I'm afraid I messed those up a bit. Tried something new and I think I have to work on that technique a bit more. ...and here's the new stuff! 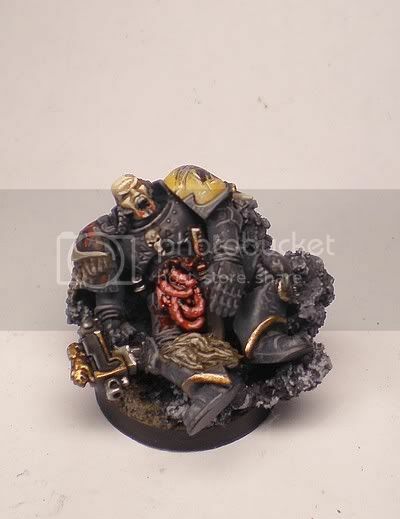 It's really nice how this one looks very different to the first Wolf Lord. So, that's tonight's update. I hope you like it. Can't see atm cos of photo-bucket's lame advertising strategy. Very excited though if they are the quality you have already put out. Might want to upload to the gallery here. No 'bandwidth exceeded' messages, and it bypasses a lot of folks work filters. I know I cannot see a lot of photobucket images while @ work. Thanks for the suggestions, especially the heads up about work filters. I'll upload pictures to the galleries here. My photobucket bandwidth should be refreshed around the 8th, until then I'll use external galleries or just my other photobucket account.